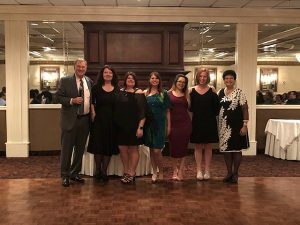 Eli and Yaffa Liebermann recently hosted Prime Rehabilitation Services’ 23rd year anniversary party in Garwood, New Jersey, honoring the company legacy in the contract therapy industry and acknowledging the hard work of employees past and present. Eli and Yaffa shared a brief history of Prime Rehabilitation Services from its inception in 1994 to the present day, including their positive perspectives on the upcoming PDPM initiative. In addition, they introduced Prime’s newest venture, Mobile Therapy Services, along with some of its key team members, including Katie Forman, COO and CFO. Furthermore, to celebrate employee milestones, six team members were honored for 15 or more years of loyalty and dedication to Prime Rehabilitation Services with a bonus reward and eleven team members were recognized for 10 plus years with rewards. In addition, Eli and Yaffa highlighted the corporate office staff, who remain an integral role in the success of the company, noting other than him, all women. Team members relaxed, mingled and had fun with good food, entertainment and plenty of photo opportunities. It is an opportunity bond over similar stories and realize the six degrees of separation is completely true, especially in this smaller industry as everyone knows someone. Please scroll through the photos, you’ll likely see someone.